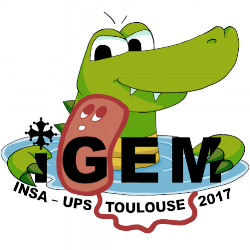 This year the iGEM Toulouse team and the INSA Lyon team have merged, leading to a single team of students from the National Institute of Applied Sciences (INSA) Toulouse, University Paul Sabatier and the INSA Lyon. The project of the team INSA-UPS Toulouse is to purify water contaminated by the pathogenic bacteria Vibrio cholerae. Cholera is still a disease that millions of people have to deal with every day. 250 000 people affected. Current treatments have limitations and people are still dying from cholera, either because it is hard to detect before cases are declared, or because patients live in remote areas not easily reachable by aid services. Thus, two solutions need to be found: one to detect V. cholerae before epidemic bursts occur and one to treat water in remote areas. We want our final device to be able to combine detection and treatment of contaminated water. Furthermore, to have a greater impact, we aim for our device to be easily used by non-qualified people so everyone can contribute to improving the quality of water. We found a solution fulfilling all these criteria using synthetic biology. Our system relies on the following biological facts: Vibrio species, hence V. cholerae, use a specific method of intra-species communication through quorum sensing. Vibrios have a specific one, using the CAI-1 molecule which binds to its specific membrane receptor CqsS. More interestingly, each Vibrio has its own CAI-1/CqsS system. That’s why, by inserting a punctual mutation on Vibrio harveyi –a nonpathogenic Vibrio- CqsS, this bacteria becomes able to detect the V. cholerae CAI-1. Using a system of communication close to the natural one will allow a strong and reliable detection of the V. cholerae in water. The final goal is to kill the bacteria V. cholerae. We decided to focus on newly described peptides from the immune system of crocodiles. They showed a promising effect on V. cholerae. A secretion system for this peptide is needed in order to have a specific and efficient response to V. cholerae in water. Obviously, the peptide specific to V. cholerae will also kill V. harveyi. It was thus essential to find a fast growing, large producer able to survive the antimicrobial peptides. Our team chose Pichia pastoris as it met these criteria, with a lot of publications supporting its ability to produce a great amount of antimicrobial peptide. Therefore P. pastoris has the role of cholera killer. The link between the two previous entities is to kill V. cholerae only upon its detection. The challenge was to find a way of communication between the prokaryotic detector and the eukaryotic killer. A previously described engineered ligand/receptor system was found in the iGEM registry. This diacetyl/ODR-10 system meets perfectly our needs. Upon detection of V. cholerae, diacetyl is produced by V. harveyi. Diacetyl is then detected by the Odr10 receptor present on P. pastoris. This cell signalling induces the activation of the pFUS promoter. Behind this promoter, the peptides can be produced by reception of the signal of presence of V. cholerae.